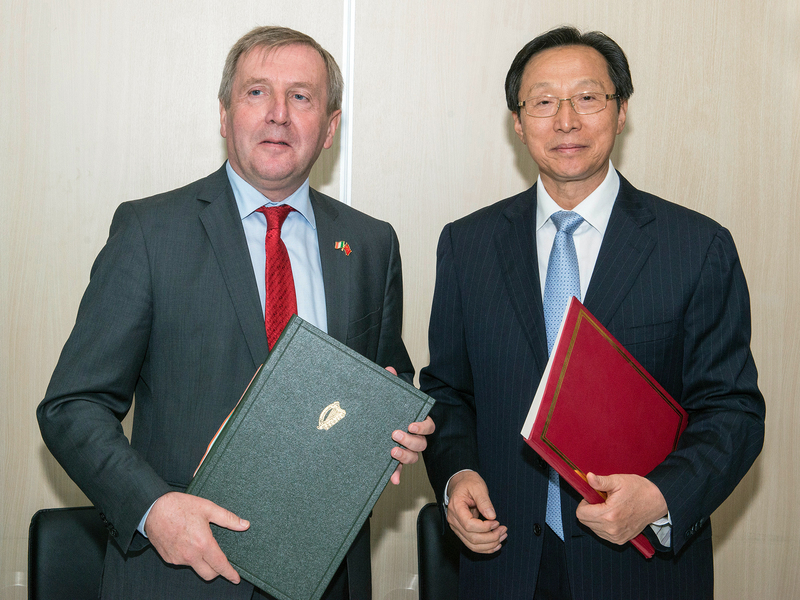 Minister for Agriculture Food and the Marine, Michael Creed TD and his Chinese counterpart Minister Han Changfu, Minister for Agriculture and Rural Affairs, met at Moorepark last Monday and signed a new Action Plan for Cooperation between their Ministries for 2019 to 2021. The first meeting of the Joint Committee on Agricultural Cooperation (JCAC) between both Departments followed. Topics covered at the bilateral meeting included: agricultural trade and economic cooperation; agricultural science and technology cooperation; food safety controls, rural development and information technology. In the afternoon, Minister of State Andrew Doyle TD escorted Minister Han to the farm of Gerard and Majella Murphy, Boherbue, Co Cork. The Murphy farm is a mixed sheep and suckler beef farm, and a participant in the Origin Green Quality Assurance programmes as well as the GLAS and Beef Data and Genomics Programme (BDGP). Minister Creed said that Minister Han’s visit demonstrates again the close working relationships which have developed between the Irish and Chinese authorities, in relation to agri-food cooperation. “Minister Han has been a good friend to Ireland and accompanied Premier Li Keqiang during his visit to Mayo in 2015. I was pleased to have this opportunity to follow up on my meeting with the Minister in Beijing last May and to welcome him to my home county of Cork. China was Ireland’s third most important export destination last year, and the second most important for both dairy and pig meat exports.